Found in rainforest areas or wherever there are species of Passifloraceae. Mature larvae yellow with 2 black bands, numerous long branched spines; head with 2 long curved and branched spines. 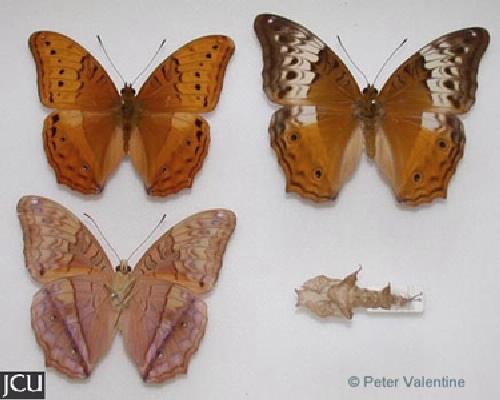 Adult male orange with black markings and some black streaks, 2 small eyespots on hind wing; female brown with similar markings. Lower surface dull orange with dark brown streaks and eyespots and other markings are more prominent, female is similar but ground colour is very pale brown. Small tail on hind wing.